In the third quarter of 2016, the real GDP growth of the US turned out to be 1.50% (year-on-year). This number is above the last quarter’s number, which was 1.28%, but if we look into the details, we would know the economy is obviously slowing down. Whereas most of the figures on the chart are still in their downtrend, there is only one that is rapidly recovering: exports. Very roughly speaking, the GDP data this time is only supported by the rebound of the oil prices and still low rates, and everything else is sinking. 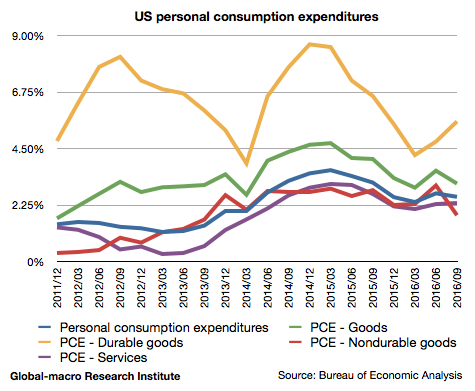 Personal consumption grew 2.58% during the quarter, slowing down from 2.71% in the previous quarter. The rates started to decline at the beginnings of 2014 and 2016, and those two timings are exactly when consumption of durable goods started to recover. So cars are driving the consumption due to low loan interest rates. This would be harmed by rate hikes. Fixed investment grew -0.71%, slowing down from the previous quarter’s 0.83%. This number is horrible especially considering it was growing 4% in 2015. 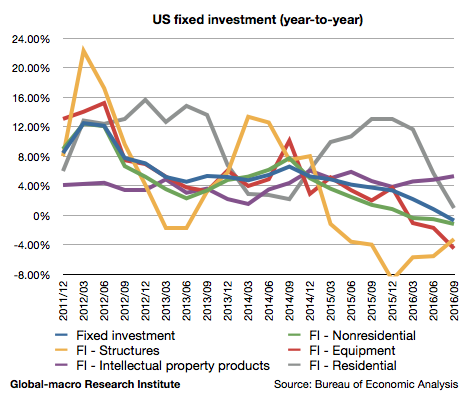 The radical fall of residential investment even with low rates is quite alarming. Structures are recovering presumably because of low rates and rebounding oil prices. As we will also see in exports and imports, what we need to care about this time is only those two factors. 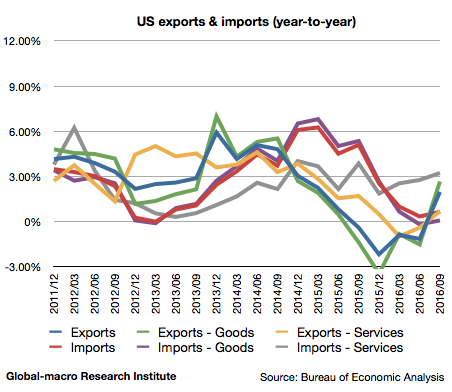 Exports grew 1.98%, massively rebounding from the previous quarter’s -1.14%. Imports also slightly recovered to be 0.66% from the last quarter’s 0.35%. Exports were the only driving figure in the GDP data this time. If we look at the details, it was again the oils. The oil prices only started to rebound in the former half of 2016, and exports hit the bottom in the last quarter of 2015, but the data shows exports of oils have been recovering so. This could be because the fall of the oil prices are due to the oversupply not the low demand. 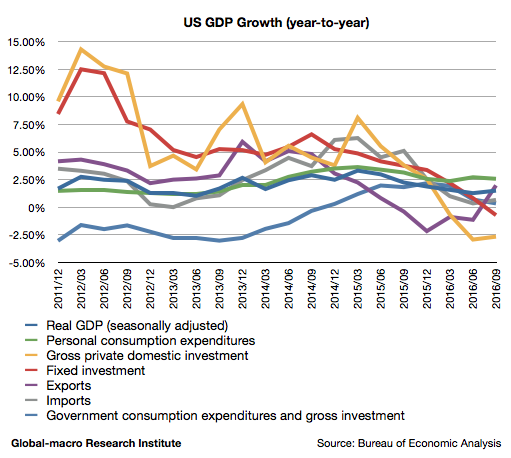 The conclusion is obvious: both consumption and investment are still on the downtrend, and only the low rates and the oil prices are supporting the US economy. 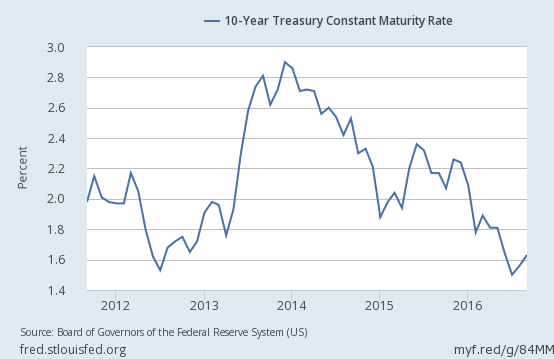 Considering this, is the December rate hike possible? In terms of macroeconomics, it would put an end to the already weak growth, but the GDP growth of 1.50% could not be enough for Ms Yellen to convince the other members. She is now fighting alone against the old-fashioned central bankers. So the question is merely how much the Fed would make a mistake. The December rate hike would be seriously harming the economy, but the Fed minus Ms Yellen could ignore it. In either case, we know the economy better than the Fed, and then we can seek investment opportunities when the Fed fails. We have already experienced the same thing in 2008.